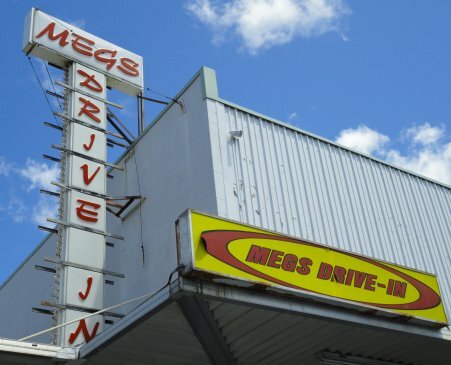 Besides “chop suey” restaurants, my father liked “diner” type restaurants. In these diners, Green River and fruit punch (the syrup variety), were cheaper than regular sodas (I think because they were non-carbonated). Plus the waitresses could refill Green River and fruit punch (not the sodas). 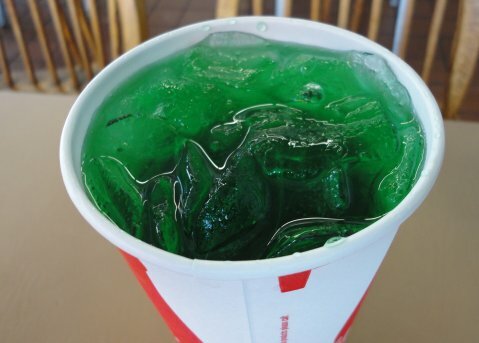 Small-kid time, Green River was one of my favorite “sodas”. Green was for boys and red (fruit punch) was for girls (because fruit punch colored your lips red, like lipstick). There’s also some emotional attachment to Green River. One year, back in the late 1960’s (I was about eight-years old), we took a summer trip to California (Disneyland, etc.). My auntie, who lives in San Francisco, wanted to take us to Lake Tahoe (Nevada). In Lake Tahoe, my auntie wanted to show my parents the casinos. Back then (I don’t know about now), no children were allowed in the casino, not even in the entrance. So my auntie, uncle, and parents went in to look around while I waited outside. I think the area was going through a heat wave when we were there. Add that to being slightly car sick from the long drive and I started feeling bleh. The guard at the door wouldn’t let me to even stand just in the doorway. I continued to wilt, melt, whatever. My father said I was outside for about 10 minutes, I say it was like 45. Anyway, he came out to check on me and saw that I was a “turning green”. He took me to a nearby coffee shop and asked for water. They wouldn’t give me water unless we ordered something. My fathered ordered a Green River, said it matched my face. Gee, thanks Dad. Sigh. Over time, Green River and fruit punch slowly faded at restaurants, and I moved on. I was following some tweets the other day and Green River came up. Turns out, there are still a few eating places that serve Green River. I was intrigued. My journey took me here. 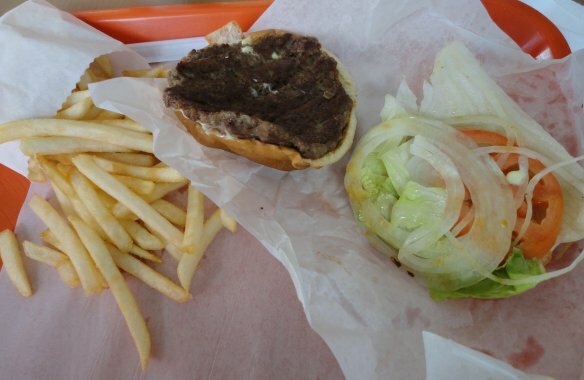 I wasn’t in the mood for a heavy plate lunch (it was the Green River I was here for), I ordered the hamburger deluxe combo (hamburger, fries, and drink) for under five dollars (cheap eats). I think the hamburger was hand formed, deluxe is lettuce, tomato, and onion (old school), fries were just out of the fryer, mustard/mayo “special sauce”. Very tasty. The hamburger of small-kid time. Yum! Don’t get me wrong, I like the gourmet, mile high, chef special burgers too. But at less than five dollars for a whole meal, sometimes “old school” is very very good. On to the main reason. It tasted exactly as before (this one had a slight fizz). No comparison to the newfangled sodas now, but everything in context. Glad to find it again (not for everyday, but once in a great while).